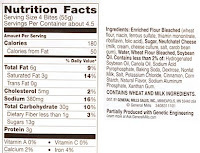 There are 18 bites in a box and 4 bites per serving. As you might suspect, they look way more sugary on the box than they do in real life. That's a shame since they could use the extra sugar. So you can microwave six in a circle or you can heat them in the oven for 8 minutes at 350 degrees. This is what happens when you microwave just one while waiting for the rest to cook in the oven. In its defense, it didn't taste that bad or rubbery this way. I will sum up my thoughts saying that they aren't terrible, but they aren't that good either. 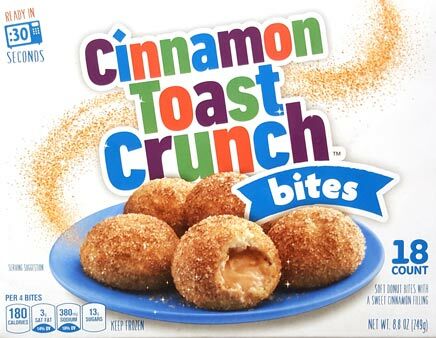 They basically taste like a generic, dry cinnamon roll that you buy when you can't find the excellent Immaculate Baking Company version. Yes, it has the cinnamon-ish filling, but I'd much rather have some kind of confectionery glaze to try to elevate the dryness. 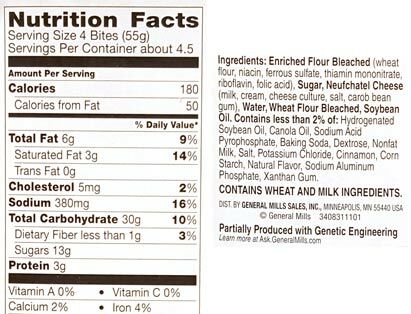 If you don't think about it too hard you can skim through a quick serving or two, but I can't say I have any urge to buy them again. Technically you can let them cool down and eat them later if you want, which is what I did because I didn't actually want to eat both servings this morning. I did have the random thought to squirt a package of Toaster Strudel frosting on the remaining ones to see if that helps balance them out. Will you be sad? Will you miss your bi-weekly audio dose of junk food? I have mixed feelings about the whole thing. Well, step back. Overall, yes, I'm like 90% sad 10% relieved it's over. Relieved because my Wednesdays will be free but sad because it's all over. I'm mixed about whether it was the right time to close up shop. On one hand I think that we were starting to find a new groove with JunkBanter, but on the other hand I often felt like we were still just saying the same old things. It may be a new treat from Taco Bell, but it's still Taco Bell. Same goes for Oreo. I will be forever grateful to Marvo for giving me the chance to participate even if I am sad that we never got super famous. Well, at least a little famous. I think Marvo had a great idea in this podcast and it would have been awesome to see the podcast steadily grow over the years, but I guess it wasn't meant to be. Wait, I'm not saying we had like 5 listeners, but it's not like we went from thousands of listeners to tens of thousands over the years. That would have been awesome and amazing to inspire that many people to try (or avoid) the latest in junk food, fast food, and more. Feel free to leave your parting thoughts on the show. It's ok to miss it but also say that maybe it was time to move on anyway. Would you want a Nosh Show 2.0 someday or would you prefer your junk food updates in small and more frequent bits and bites/bytes? I assume no one is interested in me occasionally reviewing junk food still (though it will probably still pop up on my twitter feed). Have a good weekend everyone. Back to ice cream on Wednesday. 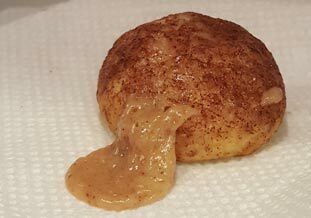 The pic of the cinnamon bite with the filling oozing out is kinda gross. 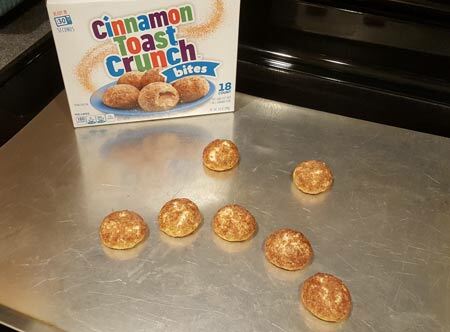 I think they just slapped the cinnamon toast crunch logo on it. If they included the actual cereal crumbs maybe it would be better. Rip Nosh Show. I’ll miss listening to you guys gab about junk food every other week but at least Ryan can get some sleep in now. @Aleksandr: yeah, definitely more rebrand than thought out product. I will definitely miss the you and the crew Dubba. The show holds a special place for me as if it wasn't for the Nosh show, I doubt I would be writing for Marvo now. I would definitely love to hear a 2.0, and I felt that Chris integrated seamlessly with everyone else; I still missed Erik of course ;). Selfishly, it's all bitter, no sweet, and zero fun factor. @D: can't forget the rants! @Joe: agreed, zero #funfactor on this announcement. It was weird to not have Eric around but Chris brought a ton of energy to the show. They will both be missed. I will for sure miss The Nosh Show. I was a listener since Episode 1. I'm so sad the Nosh Show is finished. I always looked forward to your podcast. I was especially excited to hear all of you discuss the "Mystery Oreo". Please try to do quarterly episodes to hit on highly talked about products! Not even a farewell episode, eh? That makes me sad! I really enjoyed listening to you guys. I'm definitely up for a Nosh Show 2.0 someday. You guys will be missed in my podcast feed for sure. I for one would love the occasional (say, twice a month, like the show) review of non ice cream. Enjoy your take on things. Maybe you can even do a spicy food review on occasion. I'm talking mildly spicy like the new BK nuggets or most things at taco Bell, not talking about some deep fried habanero stuffed ghost pepper, or whatever one-up product someone will release next. I forgot to personally thank you Dubba for being a part of the show. I for one generally enjoyed your rants whether I agreed with you or not. Also, especially with the show gone I would love to see more non-icecream content. While we seem to have dissimilar taste buds, I enjoy seeing your unique but well articulated perspective. @Anon: I would have tried the mystery Oreo until most of the internet seemed disappointed that it tastes like fruity cereal. boooo. @Joe: you are welcome! it was a lot of fun and nice to have a different kind of outlet for my love of food. hopefully I can mix things up a bit in the future. So sad to hear this! As one of your dedicated listeners, let me tell you how much I enjoyed the show. Dubba, I identified with your comments the most — in particular your distaste for spicy food and appreciation of simple flavors. I'll miss you boys! I loooove the Nosh show - I look forward to it, it's my favorite 'procrastinate when I should be doing work on my dissertation' podcast. There's nothing like it. Why, why would you guys end it? Seriously, I don't get it. It was great and I am sad. @Liz: sorry! apparently I scrolled down a little too far. Your fandom is appreciated! Hahaha, no worries :) Just wanted to make sure you saw it! I hope all Nosh Show podcasters will keep up their respective blogs, I read them all. Definitely sad to see it go. I do hope you continue your non-ice cream reviews as well! Always enjoyed your humorous and unique taste/take on things. :) It was such a nice balance too because it seemed like you all were interested in trying different things so it was a good spread. Oh well. RIP. Still will check out all your ice cream reviews. Very sad to see the podcast go, and I felt like Chris was doing a wonderful job bringing a lot of good perspective. I always appreciated your un-elitist views on ice cream and junk food, with your opinion based solely on your (sometimes soft haha) tastebuds. What I'm most sad about is its sudden ending and not getting a final episode to soak it up. I like the idea of a quarterly pod, maybe talking about the best seasonal products thus far and a nosh or not on some big ones coming up. @E: thanks for sticking around! I'll do my best to keep things interesting. @Sean: I feel bad that it disappeared on everyone. I will do my best to provide some closure (a work in progress at the moment, stay tuned).